As a mom of a multispecies household (as well as a trainer), I can affirm that what works for one works for the other. Follow these seven signature rules to experience the same. Consistency is the key to raising happy children, no matter how many legs they walk on. Achieving it, however, in a two-parent household can be challenging even in a mindful partnership. Heaven knows my husband and I are not cut from the same cloth: He is a King Charles Cavalier Spaniel to my hyper vigil Border Collie-ness. With effort, we work to be consistent with both our dogs and kids, encouraging our children to mind their Ps & Qs and our dogs to sit and look up politely for pats, treats, and toys. Both dogs and kids do anything for attention, and neither care if it’s negative or positive. Catch your child swearing, and he’s likely to swear again. Yell at a dog for jumping on the counter or stealing your shoe, and you’re guaranteed a repeat performance, too. Alternatively, catch your child in the act of being kind or your dog lying on his mat or chewing his toy, and watch those routines blossom overnight! Dramatic reactions to unwanted behavior, whether yelling or in the form of physical punishment, are still attention and rewarding to both dogs and kids. A better coping strategy is a redirection. When mischief mounts, children can be refocused with a project or game; dogs can also be redirected with a bone, toy, or walk. A recent study now shows that dogs, like kids, respond to the tone of our voice adding fuel to the phrase: it’s not what you say, it’s how you say it! Studies show that kids, dogs, and all mammals for that matter have the same basic needs. Children and dogs need to eat, drink, sleep, potty, and play. Schedule times for these basic needs, and your dog’s behavior will be far more predictable. And predictable is good, especially when you’re their parent! Children pick up our routines naturally, while many dogs must be taught. A dog can learn to go to his dog bed when he wants a pet, chew his bone when everyone’s busy, or play with a toy during all doorway interactions. Nothing screams “I Love You” faster than playing with a child or a dog. Discover your dog’s passion, whether following a scented pathway, socializing with friends, or fetching a ball, and take the time to do the things that make him happy! My philosophy? Dogs are family. Like furry, four-legged kids, they thrive on love, understanding, and structure. So, if you’ve ever called yourself your dog or puppy’s mom or dad, just remember you’re not alone! I do it all the time. In a world where two-thirds of all dog lovers consider their dogs family, you’re in the majority. Raised like kids, by parents who follow these seven signature rules, they grow up respectful and happy. And happy is good. 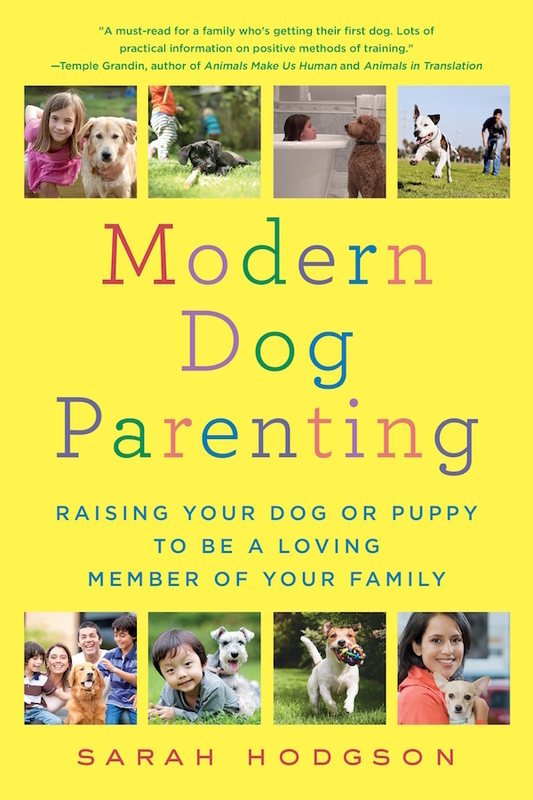 About the author: Sarah Hodgson is the author of Modern Dog Parenting: Raising Your Dog or Puppy to Be a Loving Member of Your Family, from St. Martin’s Griffin. A 30-year dog training veteran, Hodgson is an Associate Certified Dog Behavior Consultant with the IAABC, and her positive training methods are endorsed by the American Veterinary Medical Association, the American Humane Association, the American Society for the Prevention of Cruelty to Animals, and the American Veterinary Society of Animal Behavior among others. She is a Huffington Post blogger and author of 12 dog training books. Visit her at WhenDogsTalk.com. The post Why You Should Teach Your Dog Like You Would a Human Child appeared first on Dogster.